The door into the West/Central area committee. Council rules prevented me from taking a more interesting photo showing councillors and the police inside the meeting. On the 4th of February I observed the West Central area committee where councillors were considering, at an early stage, the possibility of a new dispersal zone in the city centre. While no map of the proposed zone was provided the police stated they would like it to cover the Market Square, Sidney Street and Sussex Street. Most councillors are undecided on if the new dispersal zone ought be permitted, they want to see more evidence. There is a lack of clarity over what will happen next; beyond the fact that the potential targets of these powers, the “street life community”, will be consulted by both the council and the police so their views on the matter can be discovered. I attended the last meeting of this committee on the 10th of December and asked then about the changes to the existing dispersal zone. I feel Cllr Cantrill misled me, and the meeting, when he directed me to the January Strategy and Resources Scrutiny Committee to raise my points there, as when I attended that meeting I found the leader of the council had already made his decision to renew, and shrink, that dispersal zone in secret without reference to public or councillors. The police were present at the last meeting of the West/Central Area committee, they must have been aware of what was coming up and they didn’t pipe up and explain what was going to happen either. Despite not being able to influence the decision at the Strategy and Resources Committee I did learn something from my opportunity to question the leader of the council there. I learnt the use of dispersal zone powers in the city is limited and governed by a protocol agreed between the council and the police. This protocol focuses the potentially draconian and wide ranging powers and ensures they’re only used to deal with the specific problem they’ve been introduced to tackle. The council doesn’t publish these protocols though, so I’m not yet sure how much they’re going to reassure me and mitigate my concerns about these dispersal zones, but it sounds like they might go some way. The protocol is published, and preferably a draft protocol is made available in advance for the public and councillors to comment on. Consideration is given to using the protocol to restrict the use of the powers to a certain rank of police officer; at least taking the subjective and summary justice powers away from PCSOs. That a clear commitment from the police to abide by the protocol is obtained. That councillors, and particularly the council leader, seek input into their decision from Magistrates making clear how they view the orders. In introducing the proposals Inspector Kerridge, on behalf of the police, said he was seeking these powers so his officers could use them against those they thought intended to get involved in antisocial behaviour, or who might cause trouble. If you support giving the police these powers you’ll be supporting police action against people committing “thought crimes”. More generally these powers will affect those who are not criminals, you will be giving police powers over people on the grounds that the police consider them “criminalish”. You will be asking police officers and PCSOs to hand down summary justice on the streets following a very subjective assessment of someone’s behaviour; as these assessments are so subjective they will be hard to challenge. I find it difficult to reconcile the fact that all of you, all of you at some time at least, have stood as Liberal Democrats; stood for a party which is pro civil-liberties. You, or at least your party, have just selected Julian Huppert, a member of Liberty’s national council to contest the next general election here, yet your leader on the city council renewed these draconian powers in parts of the Market Ward section of the West Central Area last week, and you are here again today considering bringing them in to more of the city centre. I think that’s disingenuous. As it happened in a debate on dispersal zones lasting at least forty minutes no one, neither the councillors nor police, mentioned the power limiting protocol between the council and the police which can form part of the approval of these orders. The item was introduced by Inspector Kerridge. He started from first principles, beginning with background on the Anti-Social Behaviour Act. Cllr Reid grew impatient saying: “Doesn’t he know he’s supposed to assume we’ve read the papers”. Cllr Colin Rosenstiel expressed surprise when the Inspector said he was only looking to see what councillors’ initial feelings were on a possible new zone; Cllr Rosenstiel said he thought the committee was being asked to give its approval or not. 78% felt there had been an increase in ASB with almost 70% linking this to behaviour to members of the Streetlife Community. Begging, intimidating behaviour, abusive language and street drinking were of greatest concern with 85% of those surveyed concerned about public drinking by the groups and resultant drunken behaviour: Of those surveyed 87% support the introduction of dispersal powers in the area. Inspector Kerridge said the survey had been carried out with the assistance of Cambridge Business Against Crime. Cllr Kightley, the meeting’s chair kicked things off himself, he said he knew of trouble concentrated near near Sainsbury’s but was not aware it was a wider problem. Having made that observation Cllr Kightley put a question to the police, he asked: “What level of deterrent is this?” seeking to find out how effective the powers are. The Inspector responded to say “The concept is it takes people away from the area”, he said the level of formal use of the powers was very low and that it was the threat they might be used, and if they were used the threat of arrest if the direction wasn’t complied with which was effective. Independent John Hipkin spoke second. He quoted from the police report which stated : “Under the Human Rights Act, the use of policing powers must always be: Necessary, Proportionate, Lawful and Accountable” he suggested that “equitable” ought be added to that list. Cllr Hipkin expressed the fact he was disconcerted by the focus on one group, the “street life community”, and expressed his view that a greater problem was present in the evenings and at night. He said he understood the police had had feedback from traders and retailers who among others like to see Cambridge as “one large shop” and would like to see those people, who they see as littering the streets and putting off shoppers, removed. Cllr Hipkin said the real problem was anti-social behaviour in the centre of the city in the late and small hours by many young people. He said Cambridge has a huge proportion of young people and stated that drunken, yobbish and bad behaviour was more prevalent among the young. He said that as Cambridge is a “juvenile city” the problem will be here. Cllr Hipkin asked the police directly: “Have you not got powers enough already?” He said he found the prospect of authorising these additional powers very worrying. Inspector Kerridge responded to Cllr Hipkin. The Inspector said that equity was important, but that there was a specific problem with a specific group of people. Inspector Kerridge said that the West/Central Area committee had prioritised tackling the problems caused by the streetlife community themselves at their last meeting when they set police priorities for the area. Addressing the question of if the powers were needed; the Inspector said he “wouldn’t be here asking for the powers if there wasn’t a gap in the market”. He said “At the moment we can’t move people on if they’re not committing an offence”. He accepted people who were committing offences could be dealt with under other laws, for example the could be dealt with for committing a public order offence. The Inspector said what was missing was a power to deal with “general antisocial behaviour”. Cllr Julie Smith spoke to say that she agreed with everything which Cllr Hipkin had said. She said she felt insecure on a Friday and Saturday night walking on St. Andrews Street, and she said that had nothing to do with “street life people”. Cllr Smith made her opposition to the dispersal powers very clear. Cllr Smith didn’t do this on the 10th of December, before the renewal of the other zone, perhaps she has been persuaded to change her mind. Cllr Nimmo-Smith, the council leader who had just renewed the zone in part of the West Central area looked uncomfortable following Cllr Smith’s speech which put her at odds with his position. Things didn’t improve for the leader when the next contribution, from Cllr Bick, began: “None of us want to see these additional powers raised”. Cllr Bick then turned to the police report, saying “You have perceptions, you have the views of traders”. He was asking for more information, more data on what the problem actually was, and asked for reasoning to be given justifying the police position that a dispersal zone was the best way of dealing with whatever problem existed was with a dispersal order. Cllr Bick then asked the question which had been one of the main points I had made at the Strategy and Resources meeting the week before; that the biggest difference between dispersal orders under S.27 of the Violent Crime Reduction Act 2006 and those under S.30 of the Antisocial behaviour act was that PCSOs had the power to give orders only under the latter ones. (This point was confirmed by the police report to the West / Central Area Committee. Supt. Brown at the Strategy and Resources Committee appeared unsure when I asked him about the current powers delegated to PCSOs). Cllr Bick said that he and his fellow councillors ought seek assurances that if they were to support giving these extra powers to PCSOs they ought ensure the PCSOs are sufficiently trained to cope with the substantial responsibility [making the subjective judgement with respect to the "criminalish" behavior and handing down summary justice]. Cllr Rosenstiel raised another point he was confused on; he said thought the police had put evidence on expanding the dispersal zone into this area before Christmas. He said there were clearly problems in other parts of the area too, such as Christ’s Pieces. (Cllr Rosenstiel needs to look at the map of the zone the leader renewed on the 2nd of January and he would see Christ’s Pieces was covered by that order. If Cllr Rosenstiel can’t keep track of which orders are effective where in his own ward then what hope do those he represent have? Cllr Rosenstiel also other areas towards the Grafton Centre as being potentially in need of an order (again he was talking about areas covered by the already renewed order, if he had wanted to comment on those he should have either said something when I raised the issue at the previous west/central committee or followed the advice Cllr Cantrill gave to me and attended the Strategy and Resources committee, where he would have been able to fully participate in the debate as a councillor representing an affected ward. Cllr Rosensteil’s points were completely irrelevant to the matters being discussed, and served only to highlight how confusing the position with respect to disperal zones in Cambridge is. Cllr Sian Reid spoke next, she complained about a “report in this form” being brought to the committee. She said there was a lack of evidence, apart from the survey of traders. She said while she also had her own experiences to rely on, she didn’t want to make a decision, or express views on a decision like this without having evidence put in front of her on which to base her views. Cllr Reid also said she needed written reasons from the police explaining why their existing powers are insufficient, she said she had heard what the Inspector had said but wanted it in writing. Cllr Reid asked if the decision would come back to the next West/Central area committee. The Inspector said the decision would not come back to the next West Central Area committee. (The decision is for the council leader and a police officer). The Inspector said the police would carry on putting together their evidence and if it turned out that they were “acting on the basis of two or three loud voices in the community than they would not go ahead”. Cllr Cantrill spoke to say he was “very wary about the comments in the brief paper” He said that while he understood the position and views of the traders he urged caution. He told the meeting that CAMBAC was a “very efficient organisation” and he felt they would have done hard work to ensure as many traders responded as possible and he suggested traders would have felt they ought “respond proactively”. I think, while choosing his language carefully to avoid saying exactly what he meant, he was saying traders might be over-egging the situation and might have been urged to over-egg it by their association. (Cllr Cantrill was careful to say that CAMBAC does some good work). Cllr Cantrill, like some of his colleagues, wanted to see evidence from other areas, beyond the perceptions and opinions of traders. I think it is notable that there was no mention of Love Cambridge in the discussion and the views of traders only were taken via CAMBAC. Cllr Cantrill, who attended for the relevant section of the Strategy and Resources committee, asked why the police hadn’t mentioned in early January, when they sought the changes in other parts of the ward, the problems which they were giving such weight to now. Inspector Kerridge responded to say: “The evidence base will be qualitative and quantitative, further work will involve the city council street outreach team and the police will seek the views of the street life community directly”. The Inspector said “the process of zone renewal is not as thorough as is demanded when deciding if we need a zone in the first place” adding “This is an area where a S.30 has in the past been taken away”. Councillors sought some clarity as the Inspector appeared to be suggesting “renewal” didn’t just mean renewing a zone on the day of expiry, but could extend to bringing one back into force which had been taken away. Cllr Dixon pointed out that some want to see the Mill Road zone put back and asked what was involved in taking zones away and putting them back. Inspector Kerridge’s rather uninformative response was: “There is a template based on national guidelines”. Cllr Dixon mused that surely cancelling a zone was something which could be done by the police alone. Up until this point in the meeting I was rather impressed by what had been said by the councillors; who had expressed opposition to the dispersal zone. Most of the Liberal Democrats who had made a speech against the dispersal zone then had a second go – making a further speech which was more of a “sitting on the fence” kind of speech. To her credit Cllr Julie Smith didn’t say anything further to neutralise her staunch opposition to the police being given the powers they were thinking of seeking. Cllr Dixon addressed the meeting to say his summary of what was happing was “one small group of people are asking for the police to be given powers which will have an effect on another small group of people”. Cllr Bick was one of the last to speak; he said he’d need more evidence before he could come to a decision. I think that point summed up the apparent view of most of the councillors as their discussion came to an end. That the views of the Area Committee are use to inform the Leader of the City Council, prior to a formal submission from the Constabulary to the Council and any decision being taken. There was no vote, consensus, or conclusion, the item was closed by Cllr Kightley thanking council leader Ian Nimmo-Smith for attending and listening to the views expressed. Cambridge Dispersal Zone Renewed and Shrunk Without Discussion -January 2010, Report on the renewal and variation of the other dispersal zone affecting the West Central Area. This entry was tagged City Centre, Dispersal Zones, Market Ward, Police on February 6, 2010 by Richard Taylor. One problem with having the new Sidney Street zone separate from the existing Christ’s Pieces zone is that those dispersed from Sidney Street zone on Sidney Street will be able to walk a few metres onto Christ’s Pieces and find themselves outside the area from which they’ve been dispersed. If people get treated in an oppressive and unfair way by the police then I think the city and the country will become harder to police. I really don’t want to live in a country where disobeying an order from a PCSO is a criminal offence (where the only offence committed is disobeying the order). I don’t think I take an extreme view on Civil Liberties / Human Rights. I worry that if we go further down the road of having an increasingly oppressive police force the country will become harder to police as people’s relationship with the police will become very different. I think abuse of powers like dispersal; along within increased use of stop and search and unjust police procedures such as holding DNA of innocent people and harassing photographers to threaten to tip the balance. There are innocent people now coming into contact with, and getting on the wrong side of, the police many times a year; innocent people used to get stopped by the police an average of just once in a lifetime. My view is those who are actually causing problems and committing offences (including public order offences) need to be put in front of the magistrates and dealt with robustly; the police should not be empowered to take any action against the innocent. The magistrates court ought to be (and is to an extent) a route though which people can get the help they need to turn their lives around – something which is missing with a dispersal. What is an Astro Shoe? Mathew Peet is apparently asking about the words in the photo of the door into the room in which the West Central area committee was held. 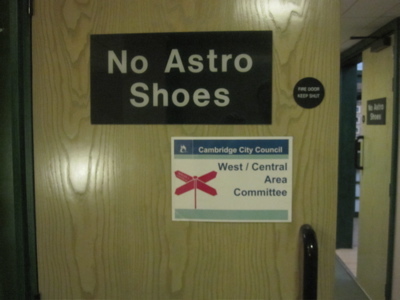 Google has images of astro shoes; quite why they’re forbidden I have no idea. Yes that is what I was asking about, I presume that makes sense if the meeting was in a sports center. I’m not sure I like the idea of West/Central Area either… can’t they make up their minds what area they are talking about? West-Central or West and Central would make better sense, I presume. I think the ‘street community’ who are drinking alcohol pose very little threat to anyone except themselves. I saw one poor guy collapse on a bench after drinking a bottle of something and being sick. This was down the side of the guild hall, and some sort of security guard was looking at him and speaking into her radio, I think she was from Lion Yard.